Fuku marked Japanese Imari / Arita sometsuke sansui kanshi chuzara. 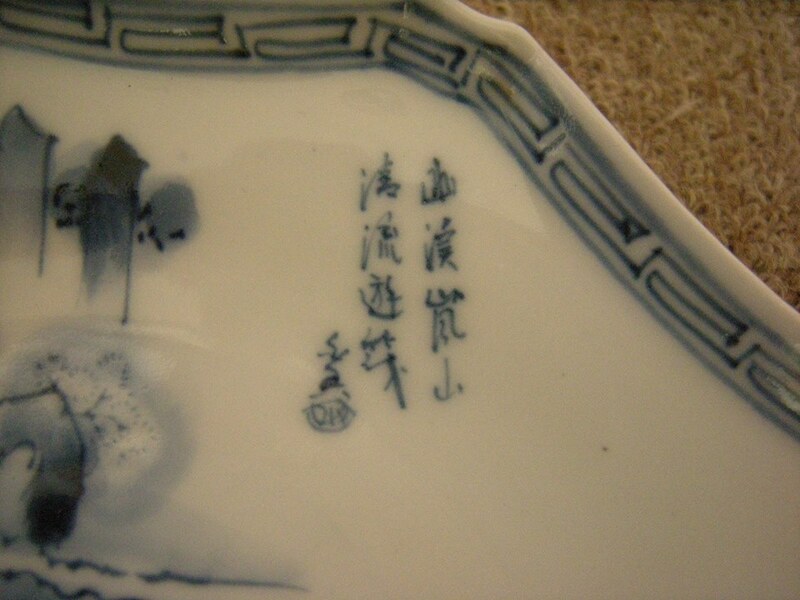 This small blue & white (sometsuke 染付 ) Imari ( 伊万 ) plate (chuzara 中皿 ) is painted with a scene of a man rowing upstream in a river towards the mountains. (sansui 山水 ) It is octagon shaped and has a short poem ( kanshi 監視 ) that reads 述(? 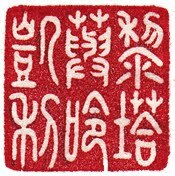 )溪 嵐山 清流遊筏. Upstream ? Arashiyama, rafting on a clear stream? 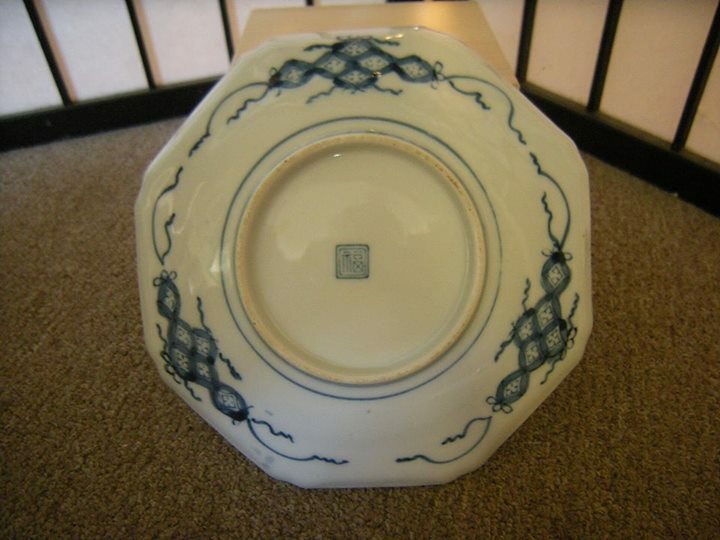 The back of the plate is decorated in an underglaze blue, cash and comb pattern and is marked Fuku ( 福 ) the Japanese word for "good fortune". Arashiyama, ( 嵐山 Storm Mountain) is Mount Arashi, across from the Ōi River on the Western outskirts of Kyoto, Japan. 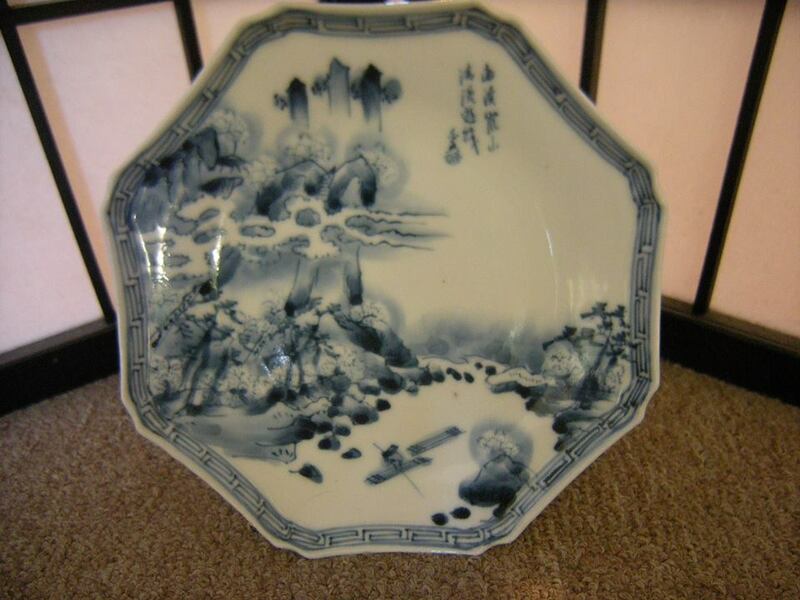 I'm not certain of this Imari plate's age, but am guessing that it's Meiji period, although it could be earlier, or later. I'll have to research this further so I can make an accurate determination. Inscription translated by my friend Hung-Yueh Hsu, Taipei, Taiwan.